It was by chance that I became acquainted with this complex Italian restaurant, L’Arianna. I was eagerly searching for a restaurant for a fancy staff dinner party as Vice Editor-in-Chief. Luckily, I chose L’Arianna. This rather exquisite diner is placed in Chungmuro Art Hall located at Sindang Station exit 2(Line number 6, the brown line). I have only visited there to watch musicals but never to eat out. Therefore, it was obvious I did not expect that L’Arianna would be ‘inside’ the musical theater hall. 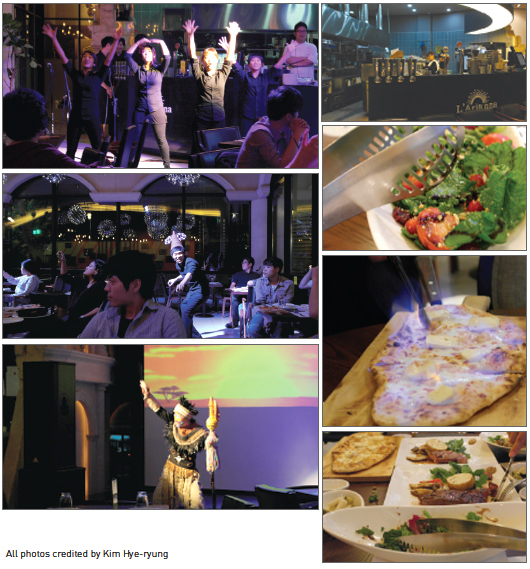 All the reporters of The UOS Times had a chance to experience this musical and cuisine mixed ambiance restaurant just after the last edition of our 123rd magazine. I visited L’Arianna as a reporter for coverage of ‘The Place’ accompanied by two of my close friends for various opinions on the food. I tried to be as gastronomical and objective while judging the taste as possible. It was a soggy dinner on Sept. 21. We ordered the Family Set A which is served with a salad, one pasta (or risotto), one pizza and a steak. I additionally added another plate of steak for the hungry boys ? we were starving by that time, not having eaten anything all day. The types of salad and steak are fixed, but visitors are allowed to choose whatever pasta or pizza they want on the menu. 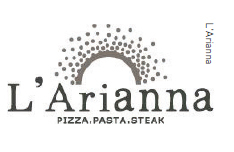 I was surprised how capable L’Arianna is of serving various pastas and pizzas which adds excitement for visitors. L’Arianna also regularly updates its menus, which impressed me. The pasta and risotto names are witty and beautiful ? for example, Napolian tomato pasta was named as ‘Napolian Woman’ in Korean. Other pastas are named ‘Kiss with the Sun,’ ‘Delicious Silence,’ ‘Casanova,’ ‘Luncheon of Fisherman’ and so on (all my translations). Sadly, they did not have the same witty menu in English. 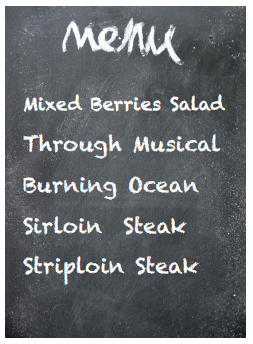 We ordered mixed berries salad, seafood cream pasta (a new dish on the menu, ‘Through musical’ was what it meant in Korean), pizza ‘mozzarella cheese and catch fire’ (Burning Ocean), striploin and sirloin steaks. First, we were served warm bread with balsamic vinegar as an appetizer. The bread was seasoned with herbs which bettered the taste softer and richer. We could order for more bread for free afterward. Then, the mixed-berries salad was served with fresh vegetables and herbs, and of course various berries. The dried berries were so sweet that they watered our mouths. The dressing was a nut mixed balsamic vinegar. No sooner were we done with the refreshing salad than came out the pasta and pizza. The pasta I ordered was the newly promoted one for September. This seafood pasta was made rich with clams, scallops, mussels, calamari and chubby shrimps. We were amazed how a single dish of pasta could have such manifold seafood inside. The pasta cream was soft and savory. I tasted baked garlic and onion. However, the whole pasta had somewhat fishy smell which I guessed it was due to the mishandling of the shells. So we had to leave some of the seafood inside the pasta. It was the worst dish of the night. The Burning Ocean was impressive. What makes this pizza so special? The pizza was literally ‘burning’ just like its name. L’Arianna’s waiter brought this mozzarella pizza with brie cheese chunks and chestnut on the top. Then he spilled Bacardi ? yes, the rum ? over the pizza and torched a light. The fire burnt bright and melted the brie cheese and the Bacardi left a sweet rum scent as it evaporated when the fire was all gone. The Burning Ocean was sweet and soft. We were all satisfied with this amazing pizza. Last but not least, the main dishes of the dinner were striploin and sirloin steaks both of which were cooked medium! I was expecting to see two different steaks to be served differently but they looked alike. (Maybe I was expecting too much on the display). Both steaks were garnished with baked potatoes and mushrooms, fresh tomatoes and basil. A special herb sauce was at the corner, and this added more aromatic taste to the steaks. I especially liked the mushrooms because they were warm and seasoned with balsamic vinegar. However, the baked potatoes were so stiff that my knife could not cut into it. It would have been better if the potatoes were much softer. My overall impression of the steaks was that they were ‘awesome.’ The meat was juicy and tender. I liked the striploin better because the marbling was just enough to chew and feel the tenderness of the meat. After we were done with the meal, we waited for the last part of the dinner. As mentioned above, L’Arianna is famous for its differentiated service from other typical Italian restaurants. The ‘Ondream,’ the name of the musical actor and actress group in this restaurant, was about to put on a musical show for us. Every Thursday to Saturday, L’Arianna provides a dinner show for customers. All the singers are new-face musical actors and actresses privately selected by L’Arianna. L’Arianna occasionally opens auditions to hire new members for Ondream. Once selected, the crew spends a lot of time practicing for the dinner show. They work as waiters and waitresses on weekdays but change into musical actors on weekends. The show started at 7:30 p.m. with a song called ‘One Day More’ from the musical Les Miserables. The crew used multimedia equipment such as a projector, spotlights and lightings, microphones and acoustic devices as well. All songs performed during the dinner show were from famous musicals and some from Disney cartoons. I noticed the change of their selection of the songs from the last visit. The opening and ending songs were the same musical numbers that I heard from the last visit, but some songs were switched with other numbers. As a musical lover, I recognized some numbers from Mozart!, Hairspray and Dr. Jekyll and Mr. Hyde. My friends and I enjoyed the professional and smooth voices of Ondream. The main singers varied from songs to songs. Some of them tried to talk to the audience which made the show more witty and enjoyable. The ending was the most grand of all the performances. The song Circle of Life was from the musical Lion King. One actress actually dressed up as Rafiki, the mandrill monkey and two waiters as antelopes (like actual actors in Lion King). This made the ending memorable. I can confidently say that the three of us enjoyed our dinner. It was unexpected luck that I was able to dine out at such a multiplex restaurant because watching a musical and dining out in a fancy restaurant separately costs an arm and a leg for university students like us. However at this place you can do both; you can enjoy a nice Italian meal and listen to refined musical songs. Be sure to remember, however, that the show is only available for visitors on Thursday through Saturday, dinner time. The overall cost of the food is rather mediocre if one considers the quality of the food and the service it provides. If you are looking for a restaurant that provides fine food and entertainment at the same time, The UOS Times definitely recommends L’Arianna to you.